Welcome to the Kariya-Porritt Domain! 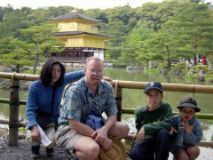 Welcome to the new Kariya-Porritt family web site! We have lots of new photos and stories, plus the web version of the 2003 nengaletter. Start your tour by clicking one of the buttons at the top or one of those below. Panos and Pictures and Movies, Oh, My! 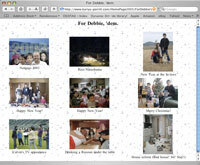 There are lots more photos and even a few short movies on our mac.com site. (Coming Soon!) Ever notice how life is sometimes like an old 'B' movie? You know, one of those war pictures where Mom and Dad are sitting in a foxhole writing nengaletters to loved ones far away. One of them turns to the other and says..."Sure is quiet around here....""Yea, too quiet...." And suddenly, 'WHAM!' The ground shakes as three guided kids slam into the front (door). Dad yells "INCOMING!!!" and dives under the couch, followed a fraction of a second later by Mom. Moments later, the invasion force streaks through the hall DMZ and starts lobbing volume grenades into the defensive positions set up behind the couch..."TADAIMA!" (We're home!) "I'm hungry! What's for dinner?" "Dad, the baseball team wants to play Nintendo! They're outside. Can they come in?""Mom! Michelle's getting into my stuff again! Make her stop!" Yes, war is hell. Especially when the other side has you outnumbered and out-volumed. 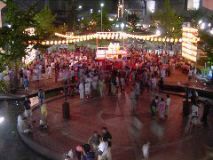 Summertime is the time for hanabi in Japan. 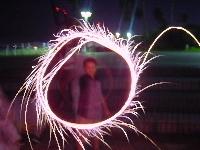 Most major municipalities will hold huge fireworks shows during their summer matsuri (festivals), and personal size fireworks, ranging from kid-safe sparklers to adults-only aerial rockets, are available at virtually every supermarket, home center, and convenience store. This year, we joined the Yasufuku, Iwamoto, and Matsuoka families for a night of sizzle and pop, zoom and boom in the park at the south end of the island. 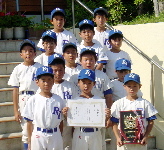 The Rokko Island C Team won their Ikkuseikai tournament! Later that evening, the team and families had a party at Ten Ten Chinese Restaurant on Rokko Island. Here are some photos of the award ceremony and the party. With at least two rabid Tigers fans in the family (and one rabid Giants fan), it was inevitable that we'd go to a game this year. 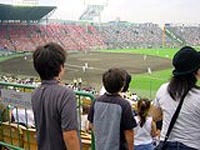 If you think that baseball is a slow, pastoral game, you've never been to Koshien Stadium to see a Tigers game! Tigers fans are the noisiest, most fanatical fans in the Japanese pro league. And the seventh inning stretch tradition of lettting off 'rocket' balloons makes a Tigers game the most colorful and chaotic event in any sport! 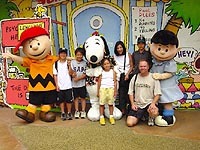 After listening to Dave 'Dem talking about how much fun they had at USJ while they were here, we decided to go, too. Alas, school was out by then, so it was a bit more crowded, but we still got to see and do quite a lot. Brian's friend, Akihito, joined us. Andy, a red toy poodle, joined the Kariya-Porritt household on July 5th, 2003. A small selection of recent pictures. Enjoy! A small selection of pictures from the summer of 2002. Enjoy! I think it was Shakespeare who long ago penned a line that exquisitely captured for Yoko and me the essence of the year 2001: Exit, pursued by bear. Actually, the bears (one, two, tha-ree!) started snapping at our heels at the beginning of the year. And weve been on the run ever since, with a nip, nip here and and a growl, growl there to encourage us to ever greater speeds. Brian turned a big 9 this summer (June 1). His birthday bash on River Mall will be remembered for all time for its mind-numbing levels of noise and chaos. While no arrests were made, the evidence was carefully photographed and made public on this site to warn future generations of parents who may be considering similar parties for their 9-year-olds. Snapshots from the family photo album. Enjoy! If Sherlock Holmes were alive and "between cases," I think I could throw a bit of work his way. I'd love to know, for example, what happened to my hair. And my mind. But the case that is sure to have even the Great House Detective scratching his head and reaching for his best magnifying glass is the Mystery of the Missing Year. Brother Michael's family pages....with wife Keri and kids Chris, Stephanie, Cameron, and Alec! Here are a couple of QuickTime VR panoramas of the view from our 36th-story balcony. Amateur astronomers: note the incredible amount of light in the night view. Not just in the sky, but BELOW me, as well! Michelle turned 3 in 1999. It's a magical age in any culture, but in Japan, children of this age (and 5 and 7) celebrate it with a special ceremony. Come inside to find out how Michelle handled her 'coming-of-age' day. She's got stories and pictures -- even a short QuickTime movie. 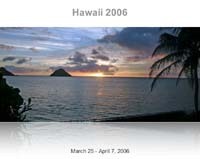 It had been a long time -- far too long -- since Steve was last back in Hawaii. (Home!) And the trip was way too short. So he can't wait to go back again. Neither can Yoko and the kids. Why? Read on! Ahh, quiet green tranquility! A rarity in Japan, I assure you. So quiet, green and tranquil is Doro Kyo (Doro Gorge) that it has become your correspondent's favorite retreat from the Kansai's manic urban bustle. This was our fourth trip to the area in the past 10 years. Virtually nothing has changed. The river is still icy cold, the valleys remain green pockets of unblemished nature, and the hot spring bath is still the perfect ending to a day of hiking and swimming. Welcome to the 1997 web site! Plenty of family photos and their stories. More Japanese culture (rotenburo, undokai, etc.) and piles of kid pics and games. Set your modems to "stun" (we're talkin' LOTS o' pictures here!) then click the graphic at left to go to the first page. Instead of sending out the standard Japanese nengajo this year, we decided to send a 'nengaletter.' 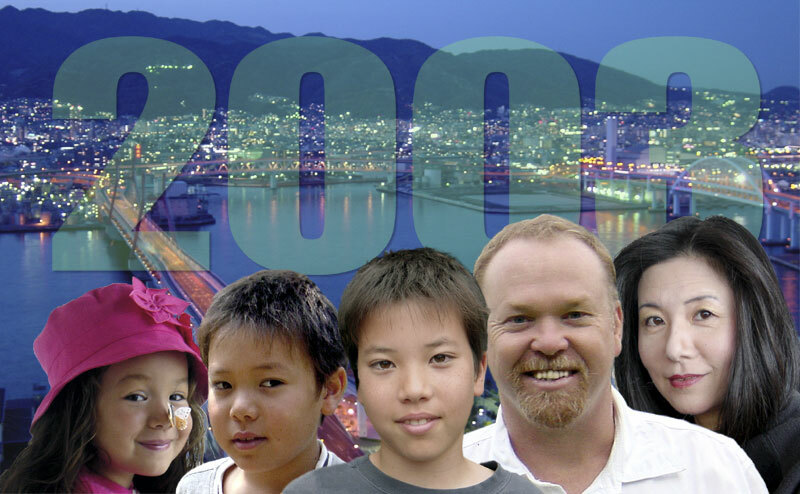 This is the web version of that letter, with lots of additions, including never-before-seen pictures of the Kobe Earthquake of January 15, 1995, and, of course, that almost-perfect -attendance-family-reunion photo! There's more on Steve's domain, 'kyomedia.com', including stories for magazines and newspapers, web site design projects, etc. Background music is Copyright © 1996, 1997 by Michael D. Walthius. All RightsReserved.